The Honorable John E. Jones, Federal judge for the middle district of Pennsylvania, gave a talk at Smith College on April 27 about his involvement in the case of Kitzmiller vs. Dover Area School District and related issues. The talk was part of a series on Ethics and Education. One effect of the Dover case has been a tremendous amount of publicity for Judge Jones himself. Time magazine named him one of its 100 most influential people for 2006. Wired listed him as one of the 10 Sexiest Geeks. He candidly admitted that he probably would not have been invited to speak at Smith had it not been for the Dover case. He had some interesting remarks about the whole Kitzmiller trial. When it began, Jones himself knew little about the "theory" of Intelligent Design, but brought himself up to speed on the subject by the time the proceedings got underway. He credits his broad-based liberal-arts education at Dickinson College with making him able to familiarize himself quickly with topics that come up in cases before him. He said the start of the trial, with its intense media coverage, was "utterly surreal." As he observed "there are few things as unnerving as conducting a trial with a row of sketch artists in front of you." Both sides in the case were "heavily lawyered up," and were utterly serious. The judge never even bothered to have discussions in his chambers with the attorneys for the two sides over procedural matters. Everything was in court, on the record. The biologists brought in by the plaintiffs impressed Judge Jones quite a bit. They did an excellent job explaining the science of evolution -- the real science rather than the straw-man versions promulgated by creationists. Jones credited their success to the fact that most of them were teachers, and thus had a great deal of skill at communicating information to people. By contrast with the biologists, the Intelligent Design people did not do at all well on the stand. Michael Behe faded badly under cross-examination, and Jones admitted he felt sorry for the man. The attorneys for the plaintiffs had studied the work of Behe and others very carefully and identified the key logical and factual flaws in their arguments. On the stand, under oath, the Creationists couldn't just blow off difficult questions or change the subject, and the lawyers bored right in. During the question-and-answer period after his talk one gentleman asked Judge Jones to explain the legal test he used. Jones explained that the Lemon test centers on purpose and effect. If the purpose of something is legitimately secular, then it can still have religious content. But that purpose has to be real. One argument the Intelligent Design people used was that ID is supposed to promote "critical thinking" -- a legitimate secular goal. Thus, students exposed to both the religious Intelligent Design theory and the materialist theory of Natural Selection would learn to analyze the arguments presented. The trouble was, the actual presentation of Intelligent Design and Darwinian evolution in the Dover curriculum did nothing of the sort. The purpose aspect of the test was by far the decisive one in the Dover case, but Judge Jones went on to apply the second "prong" of the test just as carefully. What is the effect of the curriculum? In the Dover case, again, the effect of the Intelligent Design material was pretty obviously the promotion of a religious (and specifically Biblical) narrative of creation. Even the Intelligent Design experts like Michael Behe admitted that they couldn't think of any other possible Designer except God. So the curriculum failed that "prong" of the test as well. Jones wanted to make his decision as thorough and solidly-reasoned as possible in part because he wanted it to serve as a guide for others. His Court's decisions only have legal precedent value in that district, so judges outside central Pennsylvania can't cite the Dover verdict when making similar decisions. But they can (and undoubtedly will) follow Jones's reasoning carefully. Moreover, Jones hopes school districts can use his decision to help clarify the issues in curriculum planning to avoid fiascos like the Dover case. One thing which obviously bothered His Honor was some of the commentary after he released his decision. Several pundits -- he singled out Phyllis Schlafly and Bill O'Reilly -- called him an "activist judge" and considered the verdict a betrayal from a Republican appointee. Judge Jones isn't having any of that. As he points out, a judge who ignored 60 years of precedent and decided the case purely out of political loyalty, poll results, or his own ideology would be the activist. Jones obviously believes very strongly that judges must strive to be objective and non-partisan. He was careful, though, to draw the distinction between independent judges and an unchecked judiciary without any accountability. Judge Jones believes that commentators "dumb down the public" by assuming all decisions stem from the personal agendas of the judges. (We saw a lot more of this in the recent hearings over confirming the new Supreme Court justices.) Jones suggests better civics education about what judges are supposed to do and how they do it might alleviate this. He brought up the related, and rather more disturbing issue of actual attacks on judges. There was the murder of the husband and mother of Judge Joan Lefkow in Chicago last year by a disappointed (and deranged) litigant. Judge James Whittemore, who presided over the Schiavo case in Florida required heavy personal security after several people threatened his life. If people think judges just decide things on a whim, then it's easy to see how someone losing a court case might decide to make it a personal vendetta. "The Rule of Law is not a conservative or a liberal value, a Republican or a Democratic value, but an American value," said Judge Jones. He did have some interesting background information about the effects of the decision in the Dover school district. Of the nine members of the school board who started the whole mess by adopting an Intelligent Design curriculum for the biology classes, eight were voted out in the next election. Since some of the replacement board members were the plaintiffs in the Dover case, it seems unlikely they'll bring an appeal. Perhaps getting the school involved in a legal case which ultimately cost the taxpayers of Dover more than a million dollars in legal fees had something to do with the election results. Especially since the original board apparently rejected the advice of their own district solicitor, who had warned against adopting the Intelligent Design material for just that reason. It's interesting that both of the issues touched on in Judge Jones's talk -- Creationism/Intelligent Design and judicial independence -- ultimately come down to education. People just aren't learning things they need to know. They aren't getting the civics education to understand how courts work, and they aren't getting the science background to distinguish real theories from Creationist straw men. Given that the United States spends something over 400 billion dollars each year on K-12 education, one must ask, what do they learn about? The Hubble Space Telescope turns 16 on April 24. It was launched in 1990 aboard Shuttle mission STS-31, using the Discovery orbiter. It was to have gone up in 1986 but was delayed by the Challenger explosion. At first Hubble seemed like yet another NASA boondoggle when it was discovered that the telescope's main mirror was flawed. But a mission to install compensating equipment in 1993 unleashed the full potential of the space telescope, and it's been generating amazing images and important discoveries on an almost daily basis since then. Of course, one can no longer speak of "the" space telescope. Hubble is now one of several instruments in orbit. There's also the Chandra X-Ray Observatory, and the Spitzer infrared telescope. Hubble is starting to show its age. Its gyroscopes are failing, and its orbit is due to start decaying circa 2010. Right now NASA has no plans to send a repair mission. Shuttle flights are scarce and most are already booked up, and the agency wants to keep its manned missions in orbits which can rendezvous with the International Space Station in case of emergency (to prevent another Columbia disaster). So it seems likely that we'll be getting Hubble images for only a couple more years before it finally goes dark. There is a replacement in the works. The James Webb space telescope is due to launch in 2013 or thereabouts. It's planned to be a colossal 6.5-meter infrared scope parked far off at the L-2 Sun-Earth Lagrange point. Whether or not it actually gets funded, built, and launched remains to be seen. Lockheed built the Hubble, and also manufactures spy satellites for the formerly ultra-secret National Reconnaissance Office. The joke is that the Hubble is the biggest telescope in orbit pointing up rather than down. My daughter is getting interested in robotics. I figured this out when she kept looking at the robot kits at our local toy store with the same expression I usually reserve for expensive dark chocolate. So this week we sat down to build her first robot. It’s a cute little 2-legged walker shaped like an ostrich made by Tamiya. The kit is obviously made for beginners because instead of using solder, all the wires get squished onto their contacts with tiny rubber loops. I was grateful for that. It’s not that I’m afraid of soldering irons -- I’ve built my share of Wheatstone bridges and attached wires to innumerable strain gauges over the years. But I really didn’t want the Girl’s first electronics experience to include burned fingers and cursing. The robot was really pretty simple – little more than a switch, a motor, a gearbox, and legs with a neck stuck on to make it look more like an animal. And it was easy to put together, once you got used to the pictographic instructions and exploded diagrams. But what I found remarkable, and disappointing, was the complete absence of any explanation of the science that makes the robot work. 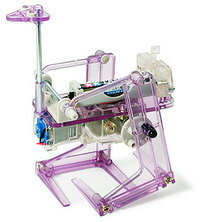 You would think that a toy that bills itself as “educational” could stick a couple of sentences into the instructions explaining why the wires have to run in a complete circuit, or how the gear box transfers forces from the motor to the legs. Maybe it’s the language barrier. Capsule Review: A fun project, but not an enlightening one. I’ve been thinking a lot about Archaeopteryx lately, fueled partly by my 3-year-old son’s total obsession with all things dinosaur and partly by a months-old discussion about Randy Olson’s new movie Flock of Dodos on The Loom. One part of the discussion revolved around how to clearly explain the physical evidence supporting evolution to laypeople. 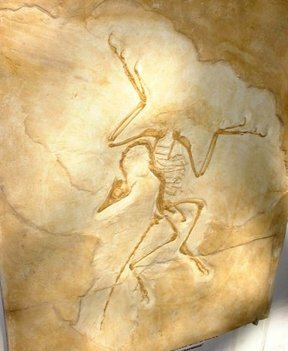 And that started me thinking about Archaeopteryx, because it’s not just the earliest known bird – it’s been the quintessential transitional fossil for more than 150 years. Amherst College’s Museum of Natural History has spent the past few months moving into a brand-new state of the art building. They’ve moved the collections into new cabinets, designed new exhibits, and mounted their impressive collection of fossil dinosaur tracks for public display. Now they're filling the main hall with Ice Age mammals. You can watch. For the next two weeks a web cam will broadcast the show as Research Casting International remounts the museum’s American mastodon, woolly mammoth, and Irish elk skeletons. When they’re finished, it’ll be spectacular. Much nicer than their former home in the old gym. Update: They were unloading bones when I drove by this morning, so things should be getting under way soon. Robots are building a telescope under the sea to search for invisible particles from the center of the Galaxy. Just being able to type that sentence makes me glad to be alive right now. And it's all true. The Antares neutrino telescope, developed by a consortium of European science institutes, is taking shape on the bottom of the Mediterranean near Toulon, France. The reason they're building it way down there is simple: it's dark. In the total blackness of the seafloor, sensitive photocells can detect the very faint luminosity produced by neutrinos interacting with other matter. Neutrinos are so immaterial that they can penetrate thousands of kilometers of solid matter without being affected at all. This means Antares can actually look through the Earth at distant neutrino sources. In earlier posts I've mentioned that the Universe of visible matter that we can sense is just a small fraction of the vast dark world beyond our senses. Neutrino telescopes like Antares give us one window into that dark world. In the past we've had some things to say about how dumb it is for people to attempt to interject religion into science. In the interests of fairness, I will now comment on an equally stupid attempt to interject science into religion. Here's a news story, courtesy of LiveScience. "Jesus Could Have Walked on Ice, Scientist Says." It's an attempt to explain the miracle described in the Gospels, when Christ appeared to his Apostles as they were in a boat on the Sea of Galilee. Christ was walking upon the water. Here's Matthew's version. Florida State University oceanographer Doron Nof speculates that freak climate and salinity conditions might have led to the formation of hard-to-see ice on the surface of the water, providing a surface for someone to walk on. Okay. There's just one problem with this: the miracle is described as taking place during a storm, and many of the Apostles were professional fishermen before Christ recruited them. So Nof's model requires ice to remain stable enough to walk on in the middle of a storm (and in weather suitable for large outdoor gatherings, since this takes place shortly after the miracle of the Loaves and Fishes). Moreover, it requires a group of men who spent a considerable part of their lives sailing those very waters to be fooled. As at attempt at "debunking" it is almost as implausible as a man walking on water by Divine suspension of the laws of physics. Why am I so worked up about this? Because it makes scientists look like a bunch of patronizing idiots. Just like a Creationist trying to show how dinosaur fossils are the result of Noah's Flood, a scientist trying to "explain" Biblical miracle stories is not just getting it wrong, he's missing the point. He's pointlessly baiting those who sincerely believe. And he only gives ammunition to those who do want to let religious or political agendas shape scientific results. It's also not very good science. Nof is speculating without good data. Unless he's tested ice formed under conditions similar to the Sea of Galilee during a storm to see if a person could walk on it and convincingly appear to be standing on the water, this is nothing but empty speculation. This is especially weird because Dr. Nof is obviously a respected and established scientist. He's not some marginal figure trying to jump-start a reputation with some controversy. Last year he was awarded the Fridtjof Nansen medal by the European Geosciences Union. Small game companies can get away with being tactless; leading scientists should know better. An MIT researcher studying child brain development says kids naturally think like scientists. This shouldn't surprise most parents: children are natural learning machines. Everything is new and interesting to them. Sometimes their need to stop and study phenomena like bugs on the sidewalk or dust motes in a sunbeam drive parents to distraction when there are places to be and chores to do. So why don't all kids grow up to be Richard Feynmans or Lynn Margulises? Why is science only the preserve of hyperintelligent geeks rather than a universal pursuit like sports or cooking? Like sports or cooking, science is something which geniuses can do better than everyone else, but which just about anyone can learn to do competently and enjoy. And yet that doesn't happen. How is it that children's love of learning and discovery gets ground down into boredom and disinterest? Science education, especially at the primary school level, doesn't help much. I have a suspicion this is due to the fact that most teachers are trained in education and simply don't have the science background themselves to teach it effectively. All the teachers' manuals and support material in the world can't substitute for a good college-level grounding in the sciences. Except games. Games can solve everything.